That’s the word this season, as expenses beyond our control, such as electric power for our 25,000 watt transmitter, continue to rise. Thank you, thank you, thank you for supporting our work and for keeping us in your thoughts and prayers! 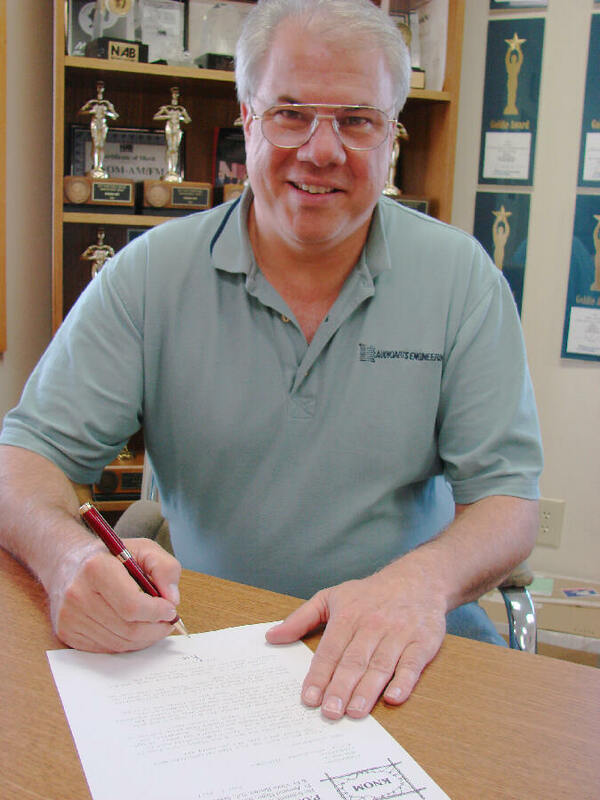 A SIGN: (left) KNOM general manager Ric Schmidt signs a thank-you letter in the station’s front office. A 1984 KNOM Jesuit Volunteer, Ric went on to become the founding general manager of Catholic KBVM-FM in Portland, Oregon. 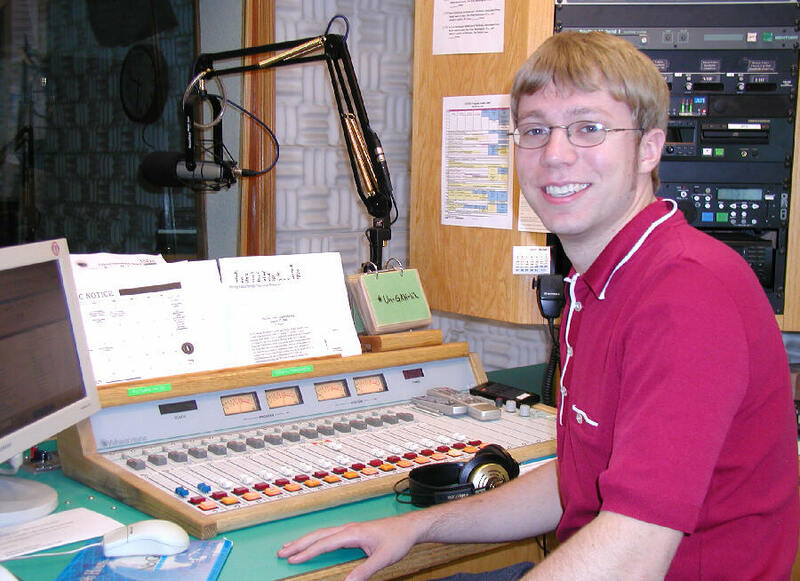 In 1995, he returned as program director for KNOM, and replaced Tom Busch as general manager in 2005. Behind Ric, you can see a few of KNOM’s major awards. NEED: As we reported to you in May, the computers which record all of our audio, play it back and run the mission overnight are growing frail. Thanks to your generosity, we have been given $32,084 toward their replacements, which will cost approximately $80,000. This system is the equivalent of 10 workers who labor 24 hours a day for 18� an hour with no benefits. Thank you for your continued help! THUNDEROUS: June 11th brought a rip-roaring thunderstorm to Nome, thanks to a rare searing temperature of 70�. Typically, we see a T-storm every five to ten years. At the same time, if you flew over the open Bering Sea, you would have seen it thoroughly littered with chunks of ice, from small to immense. CHANGING OF THE GUARD: (left) In July, we say farewell to volunteer Ross Reilly, after a hardworking year as morning announcer and music director. Ross isn’t sure of his next step, but he promises “it will be some kind of adventure, akin to moving to Nome.” Thank you, Ross, for a terrific year, and God bless you in your future quests. In June, we welcomed new volunteer Kristina Proctor. Look for a photo next month! 19,800: That’s the number of inspirational spots KNOM has broadcast so far during 2007, plus an equal number of educational ones, plus the Mass, the Rosary, news, positive entertainment, and more, thanks to you. Thank you for supporting the oldest Catholic radio station in the United States. INSPIRATIONAL SPOT: God’s promises are like the stars. The darker the night, the brighter they shine. IT’S NEWS TO US: (left) Public affairs director Amy Flaherty prepares for the 4:55 PM newscast. 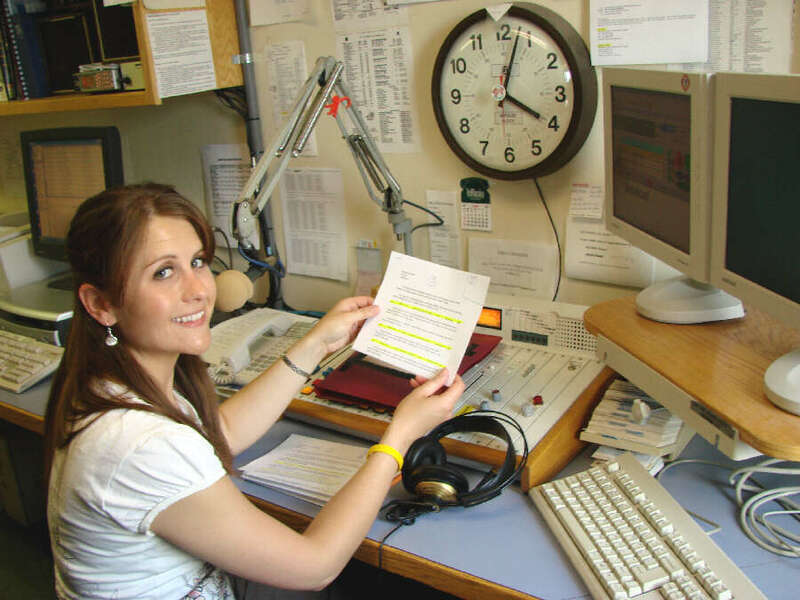 In June, with Paul Korchin and Jesse Zink briefly away, Amy headed the news department and was the voice of KNOM news for ten days. For most people in western Alaska, the KNOM newsroom is the only source for news concerning this vast region. In June, Amy entered her 6th year with KNOM; she began as volunteer morning announcer in June 2002. She brings tremendous life to the mission, and her insightful interviews brighten the day. DIG IT? 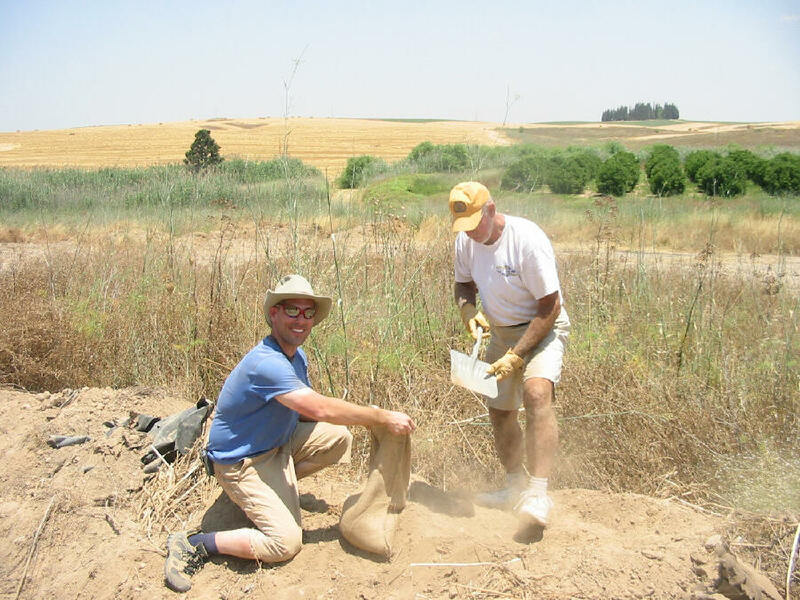 If you were in Israel in June, you might have bumped into KNOM news director Paul Korchin (kneeling, left), who was volunteering on an archaeological excavation during a well-deserved vacation. By e-mail, Paul reported that he was in a relatively safe area, though "only 25 kilometers or so away from Gaza." Paul holds a PhD in ancient Middle Eastern languages from Harvard University, and his hobby is writing scholarly articles. FOR THE BIRDS: Little Sister Alice Sullivan has produced a large number of educational spots on her hobby, the birds of western Alaska. July’s topics include ravens and warblers, the bristle-thighed curlew, raptors, the dipper, and the long-tailed duck. We are delighted to host a radio series by the Little Sisters of Jesus, who have been a deep spiritual presence in Nome since 1952. Please consider adding the KNOM mission to your will. We prayerfully apply all such gifts to funds that protect the mission for future emergencies and provide future major improvements. INSPIRATIONAL SPOT: When we truly love God, there is no room for self. True love does not look out for self, but for others. False love seeks to possess. True love seeks to be passionate. True love leads to life-giving ministry. In our lives, who are the lepers, the unclean people beyond our walls and out of our eyesight? How might we be imitators of Christ, reaching out to the lepers of our time. To do less is to doubt that the power of Christ can change us and our world. INSPIRATIONAL SPOT: Jesus told His disciples that the devil would not easily give way to people who wanted to dedicate their lives to God’s way and God’s kingdom. We are told that God will not abandon us. We need to trust and act in a way that says that God is leading us. With that act of trust, all suffering, evil, downturns in life and other mishaps can seem rather trivial. With the Mind and Heart of Christ, may things that once seemed impossible become possible. 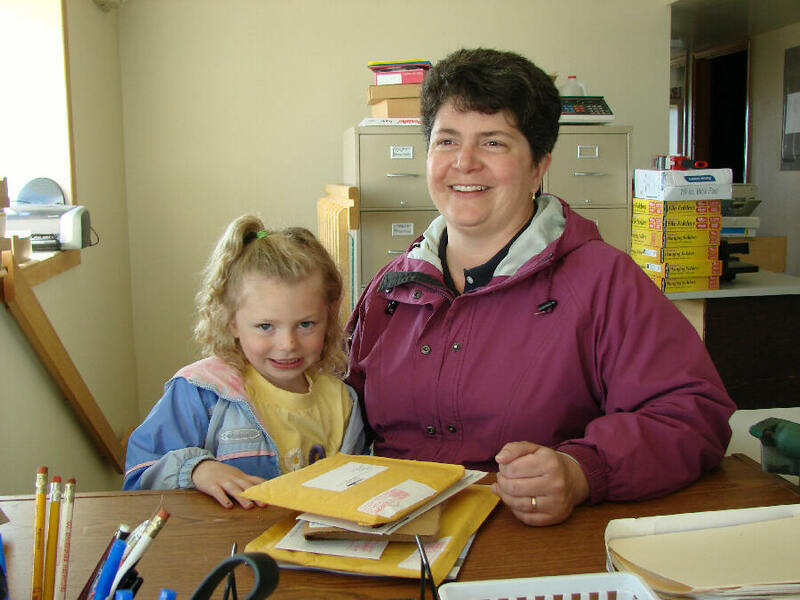 WE’RE GLAD SHE’S BACK: (left) KNOM’er Betsy Brennan sorts the mail with the help of daughter Sarah. Betsy was a KNOM volunteer from 1988 to 1990. She remained in Alaska, married, and served as biologist for the Alaska Department of Fish and Game before her children came along. This year, Betsy agreed to help out in the upstairs office. If you send a note to the station, there’s a fair chance that it’s Betsy who will open it. Sarah can’t write her name yet, but she can spell it out loud, and if you let her, she will type it using the upstairs typewriter. BEAR WITH IT: (left) In Studio A, this June announcement from Fish and Game was a reminder that we live in the wilderness! INSPIRATIONAL SPOT: A forget-me-not doesn’t strive to impress anyone. It doesn’t struggle to be different than a blue bell. It doesn’t have to. It is different. And there’s room on the tundra for every flower. WELL GROUNDED: (left) In the village of St. Marys, Fr. 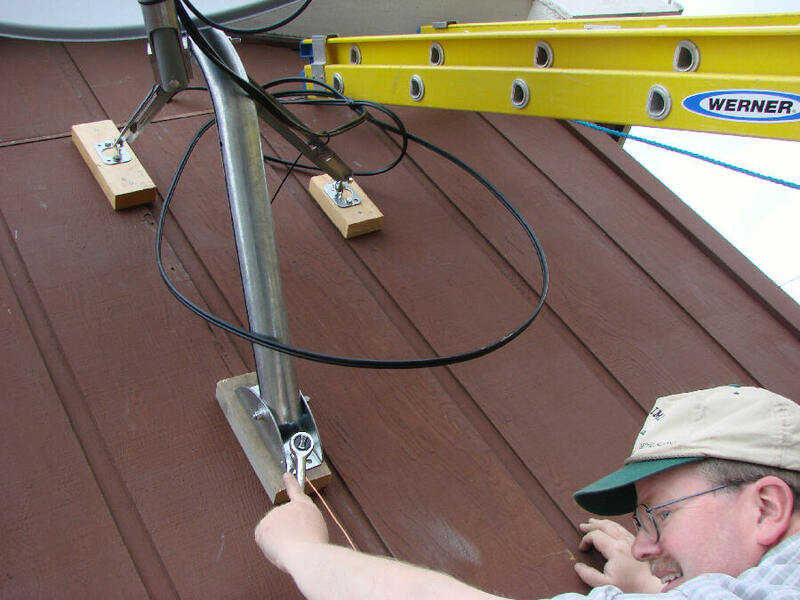 Paul Cochran, SJ, tightens the ground wire on the HughesNet satellite dish that feeds audio to the 10-watt KNOM translator transmitter. Fr. Paul helped Tom Busch install the system, as well as one at the village’s Jesuit residence. Fr. Paul is currently superior for the Jesuits in Alaska. He’s well known throughout the Yukon Delta and Bering Sea coast, and is familiar to folks even farther away, thanks to the weekly “The Lord Be With You” program he produced and hosted for several years over KNOM. He is also the author and the voice of the inspirational spots on pages 2 and 3 of this newsletter. (Left) Augie Hiebert, at KNOM's 25th anniversary celebration, July 14, 1996. 30 YEARS AGO: In July 1977, KNOM’s news department reports that Alaska Fish and Game officers have taken to the water to drive a young moose back to shore. It had been swimming toward Russia, 160 miles away. YOWCH! In Nome, a relatively “inexpensive” location in western Alaska, home utilities cost between $275 and $300 a month. Fuel oil, a costly $2.00 a gallon three years ago, has risen to $3.89. Overall, food prices in Nome are 203.1% higher than those in Portland, Oregon. As we have reported to you, village prices can be two or three times higher than that. In one village, gasoline is $8.11. Please join us in praying that throughout the brief summer, our listeners will successfully harvest fish, berries, tundra greens and meat that they can put away for the winter to feed their families, as for a fair percentage, store-bought food is becoming out of reach. 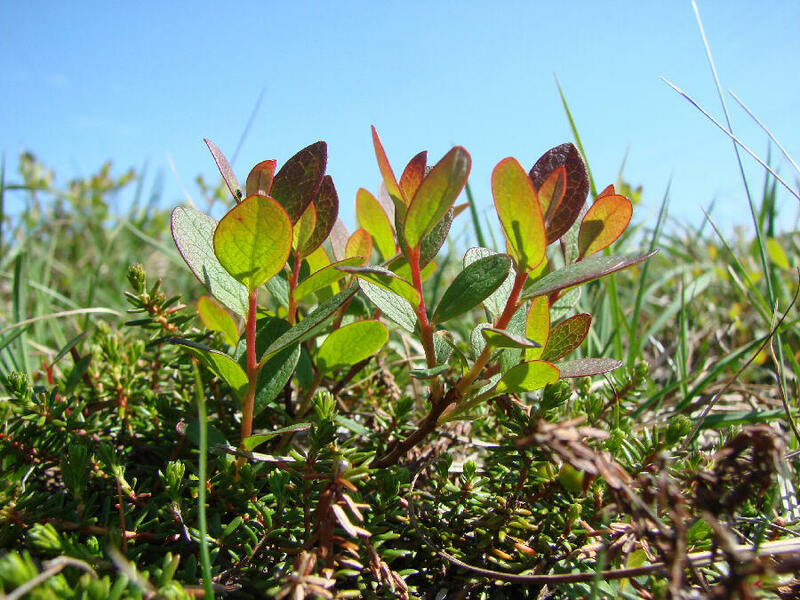 In the middle of June, tiny plants come to life on the tundra at the KNOM transmitter site, 3 miles east of Nome at the mouth of the Nome River. Just three months earlier brought subzero temperatures and snow driven by hurricane-force winds. 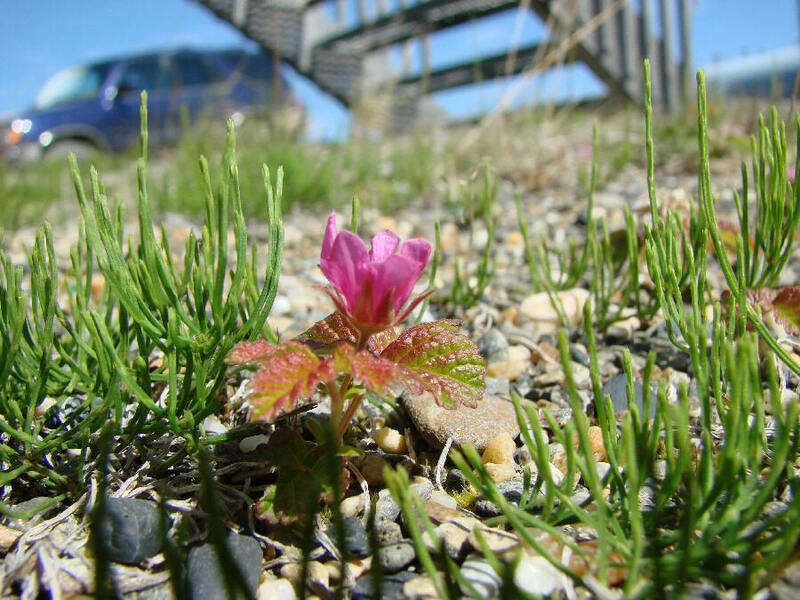 This tiny flower, about the size of a small pea, rises from the gravel beneath the transmitter building's stairway. A few feet away, another plant awakens and welcomes the Arctic summer from the spongy tundra. WE NEED YOU. We truly do, and we value your prayers, your contributions and your thoughtful concerns. May Our Heavenly Father bless you and those you love for your kindness to His remote people whom we serve.